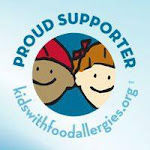 Made By Raffi: A Children's Book Giveaway! I was contacted a few weeks ago by an author named Craig Pomranz. He was hoping I would be interested in helping him to promote his children's book Made by Raffi. I was happy to help him out by writing a little review of the story on this blog, but once I learned what the story was about, I knew I wanted to do more: I wanted to get this book into the hands of the people. Luckily, Mr. Pomranz was more than happy to accommodate my bigger-than-a-book-review plan and SENT ME TWO COPIES OF HIS BOOK TO GIVE AWAY!!! I'll be giving one book away here on the blog and one away over on Instagram (you will need an account and must follow @sarah.livelaughlearn to enter). But first, let me tell you a little about the book and introduce you to Raffi's creator. Keep reading all the way through, though, and you'll find details on entering for your chance to win this fabulous prize. Raffi is a little boy who isn't like the other kids...particularly the other boys in his class. While the other kids were tumbling about and throwing things, Raffi preferred less noise and gentler activities. 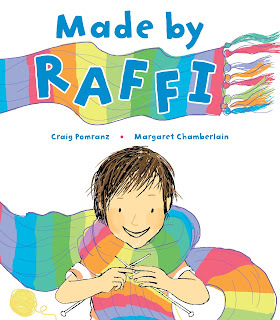 With the help of his supportive teachers and parents, Raffi finds an activity that keeps him busy, makes him happy, and that he excels at: Raffi learns to knit. Though at first he is teased for his new hobby, Raffi stays true to himself and continues to pursue his own interests. Ultimately, his talent saves the day and the other kids finally appreciate Raffi's gift. Just Be You, whoever and however You are. I love this character. I love that he is resilient in the face of his classmates who do not understand him. I love that his parents (and teachers!) understand him and encourage him to pursue this uncommon hobby. I love that, at the end of the story, Raffi's hard work and dedication to his craft are not only accepted but appreciated by his peers. Where did the inspiration for Made by Raffi come from? Made by Raffi was inspired by my godson, Raffi, who was around nine at the time. He was feeling very separate from the other children at school, particularly the boys. He didn't like noise or rough play and yet he had a hard time sitting still. He started staying more to himself and to help calm himself he started to learn to knit. He found it very soothing and started knitting everywhere. At some point he came home and asked his mom if he was "different," wondering if there was such a thing as a "tomgirl"? He coined a term not really in use, yet its message was so clear. His question was very layered with other thoughts about the world in which he is being raised. A tomboy is an accessible, even positive idea -- in our society it is understandable and possibly supported when a young girl wants to be more like a boy. When a boy exhibits any sort of "feminine" behavior or interests, however, he is vilified. And what is the message to little girls? Are their behaviors so inferior that no little boy should prefer them? I immediately wanted to write about it. Why do you feel it is important for children to see a character like Raffi represented in their book collections? I wrote the book for parents and teachers to read to, and with, children. Bullying, teasing, and embracing our differences have moved to the top of the agenda for families and schools. I hoped the book would provide an easy and humorous way to raise these very serious subjects. Young people who are teased can see Raffi as a role model -- he quietly continues pursuing his interest and shows his classmates that being different can be cool. Parents can learn something from Raffi's parents, who give him unconditional love and support, but do not encourage him to see himself as a victim. And perhaps bullies will see themselves in the book, and can learn some empathy. After all, who hasn't felt "different" from time to time? I never imagined I would write a book. But I love children and have always been very involved in the lives of those kids around me. When I was told about this incident I believed that others could learn something from Raffi's story and his loving parents and teachers. It might! The book has been translated into eight languages and is in eleven countries to date. With Margaret Chamberlain's delightful illustrations, Raffi has become a popular character and several people have asked to see more of him, including my publishers. I am working on several projects. One is a book about body image that I hope will empower children. My professional life has always been primarily as a singer touring in clubs. So I am excited to have released the song "Different" that was inspired by Made By Raffi. My friends, composers Amanda McBroom (Bette Midler's award-winning song "The Rose") and Michele Brourman (The Land Before Time), wrote the song and I provide the vocals. You can download it now from iTunes here: Different. I'm so excited to be doing my very first blog (and Instagram) Giveaway with a prize that I love as much as I love this book. I'm giving one hardcover copy of the book away here on the blog, if you'd rather enter the Instagram Giveaway, head on over here for more information. 1. Share this blog post on Facebook, tagging at least one friend in the post. 2. Come back here and leave a comment, letting me know you've shared it. 3. Cross those fingers that your comment is randomly chosen as the winner! 4. If your comment is selected, I will reply to your comment with instructions on how to send me your mailing address. Now start sharing and commenting...you're going to LOVE Raffi! He walked into my room as I was just finishing getting dressed this morning. "I saw you with the balloons." I froze, momentarily, before turning to face him, my firstborn, my nearly 9-year old. My Evan. I met his eye as I sat on the bed, motioning for him to join me. "Tell me the truth," he said, not breaking eye contact. The truth? The truth is, last night, I got lazy. St. Patrick's Day is a gimme holiday. A few leprechaun pranks, a few treats in the shoes, and done. But even for a true Irish girl like myself, I've lowered my once-relatively-high bar. No more green shamrock-shaped pancakes, no more leprechaun footprints all over the house. No upturned furniture. For God's sake no leprechaun pee in the toilets. Last night, I filled their shoes with little treats, colored their milk green, and blew up a few green balloons for them to find in their rooms when they woke up. That was it. Until it became so much more. I listened for the younger two, who were playing happily downstairs, before I began. This was it: The Conversation that had been on the tip of my tongue for the past year, waiting, knowing its time was near. I didn't think it would be like this...not in the few moments before the mad-dash of Getting Ready For School was to begin...not alone with him in my room, while Sam was out taking the dog for a walk...not on St. Patrick's Day of all holidays, this one is supposed to be the easy one! "The truth is, buddy, that holiday magic is real. That excitement you feel as a holiday gets closer, that happiness you feel when you first wake up on a special day...those feelings are real. That magic is real. But you did see me with the balloons last night because I was helping the St. Patrick's Day magic happen. That's one of the best parts of being a mom or dad...you get to help make magic for your kids." I paused, not knowing how he was going to take this news. "So, there's magic for all of the holidays? And you and Daddy help make all of that magic?" "Yup. We help make All of the magic. And now that you know the Secret of the Magic, you get to help us make the magic." At this, his eyes flashed wide and a grin crept into the corners of his mouth. "Like how?" "Well, next year on the night before St. Patrick's Day, you can help me and Daddy set up some leprechaun pranks for Max and Molly. And that reminds me: With Great Knowledge Comes Great Responsibility, buddy. Now that you're a Keeper of the Magic, it's your job to help spread the magic, but it's also your job to protect it. You are old enough and clever enough that you figured out the Secret of the Magic all on your own. You were ready for the truth. But if you were to give the secret away to someone who hadn't yet discovered it, they would feel sad. Like they didn't have the chance to figure it out by themselves. Do you understand what I'm saying?" "You have to protect the Magic for Max and Molly. Let them discover the secret on their own. It's not your job to tell them the truth, it's your job to keep the magic alive." "So, do you and Daddy do Easter Magic?" "And do you do Christmas Magic?" His sly grin continued to grow until he was practically SMILING. "I'm proud of you, Ev. We're going to have a lot of fun, now, creating holiday magic together. Do you have any more questions?" "Nope!" he sang, before bounding down the stairs. I listened closely, fingers crossed that he wouldn't go downstairs and blow the whole damn thing for his brother and sister. I heard Max's voice first: "What were you doing up there, Evan?" Then, without missing a beat: "Cleaning bathrooms." I had been dreading this conversation almost as much (maybe more than?) the Where Do Babies Come From? conversation. Creating Magic is one of the best perks of this parenting gig and I didn't want that magic to be tarnished by a negative reaction to the truth from him. I didn't want him to feel played. I didn't want him to feel as though the joke was on him. I wanted him to feel as though Magic is Good and Fun and Special and Worth Sharing and REAL. Because it is, by the way. You can see it in the twinkle in your kids' eyes...and it doesn't have to be in the form of leprechauns and Santa. Parents, teachers, and caregivers make magic for kids every day. He handled the conversation well because he was ready for the truth...but only so much truth. He didn't ask any questions deeper than those which would glean surface-level information before I sent him off to school. I kissed him goodbye, exhaled, and added another Milestone Badge to my Mom File. Tonight, after we had read and turned out the light, I sat next to him tickling his back for a few minutes. "Mommy? Like, what kind of Easter Magic is there?" "Well, you know when you wake up on Easter morning and there are eggs hidden all over the house?" "And this year, you'll help us." "Mommy? How do you help with Christmas Magic?" I wanted to tread lightly here. This is the Big One. "So, Bear Ticklish [Our Elf on the Shelf]? Well, we make the Elf Magic. We move him around from place to place each night." "Did YOU toilet paper the bathroom that one time?!" "And the zipline in our old house?!" "Why didn't you do any of that crazy stuff this year?" "Daddy and I have been making Elf Magic for a long time. We were kind of running out of ideas!" "Oh, well, I have a TON of great Elf Magic ideas for this year!" "I'm sure you do! I can't wait to see them all." "Mommy? I know you move Bear Ticklish...but is he real?" "You mean does he fly to the North Pole each night? No. He's a symbol; a reminder to all of us to work extra hard during the Christmas season to be kind and helpful and generous and to think of others. Seeing him each morning reminds us to be our best. He's a real symbol, but he doesn't come to life." "Mommy? What about the presents?" "Well, buddy. What do YOU think about the presents?" "I think that's Santa's Magic." "I love you, buddy. Good night." We are peeling back the layers and discovering, little by little, the truth. But the Magic? The Magic remains. We moved into this house, our new house, our forever Home, when Max was two-and-a-half. While as artistic, musical, and talkative as he continues to be today, he had not yet discovered his penchant for all things pink and glittery. In fact, he hadn't really expressed a unique interest in anything over everything else. So, when it came time to choose a theme for his bedroom (because I work well within the confines of a theme) it was up to me to do the choosing. I chose Outer Space. I found cute planetary decals at Target and, with the help of silver Sharpie orbits and black Sharpie planet labels, a solar system was born. Combined with a navy and gray color palette, the room came together nicely and easily. But it soon became apparent that it wasn't Max. He was interested in outer space insofar as most preschoolers are at some point, but his room didn't reflect his true interests or preferences. So, little by little and over time, he made his room more Max. First, he updated his room by taping coloring-book cut-outs of the Lalaloopsy girls among the planets. He filled his book shelves with Strawberry Shortcake books and the Rainbow Magic Fairies Series. He hung pink, sparkly salt dough ornaments from his blinds. His Mom Mom and Pop gave him a tiny wind chime with pink flowers on it that he hung from a dormant light switch. We bought him new sheets: Where once he lay upon rocket ships and stars, he now slept on pink gingham with ballet slippers embroidered on the trim. He was happy in his room...but it still nagged at me. In a house full of others and shared spaces, his room should be his. It should be him. "Max, would you like to repaint your room someday?" It was as though he thought I'd never ask. "Oh, YES! And the walls will be pink and the accessories will be pink and white and gray and you can take down my rocket ship painting and put up some ballet slippers, you know to go with my sheets! And I can have a white lamp with a pink lampshade or maybe a white one. And pillows! LOTS of pillows on my bed! I'll be able to lounge like this...like a princess who just fainted! Only, I'll lounge like that when I read! Can you paint it today?!" Clearly, it was a bedroom makeover not to be deliberated over. And so, without spending too much time gathering the materials, we knocked out the first inside DIY project since we moved into this newly constructed house almost four years ago. We started by finding the perfect shade of pink for the walls. I had been warned about pinks....that they look so much more pink when you get it on the walls than they do on the card. I wanted to avoid bubble gum. I browsed the barely-pinks by name until I knew we had a winner: Ballet Slippers Pink, by Valspar at Lowes (CI 214). It is The Perfect Pink. And its name was serendipitous. It took two coats of primer to cover the silver orbit lines and three to cover the black planet labels, but once primed, the painting didn't take long at all. I even challenged myself this time and didn't tape! I figured that, with a shade so light, it was a good time to practice my steady hand. I had to touch up the ceiling in a few spots, but overall, not taping was definitely a time saver. And then, it was a matter of accessorizing. I switched out his rocket print for a set of ballet slippers (a perk of having owned a stationery/art print business...I have access to all of my own designs forever and free of charge!). I rehung his newborn photos beside the window and we found a new spot for his name letters. ...and finally, we added his Birds. I know it may not be High Design, but I love these peel and stick wall decals for my kids' rooms. Instant personalization, relatively cheap (these were $18 at Target, Wall Pops brand), and super easy to install and remove. Max named his birds. From left, meet: Daisy, Rose, Daffodil, and Barry. As he watched me hang them up, he noticed that the bars of the bird cages are behind the birds. The birds are essentially perched on or flying past the cages. "It would have been really sad if the birds were in the cages, wouldn't it, Mommy? It's better when you can just be free, right?" Free to be you, Maxwell. It is so much better this way. I hope you love your new room as much as we loved putting it together for you. The comment wasn't out of line. But it still hurt to read it. While I don't think I was rude to the woman at all in the moment, certainly my feelings toward her, which I expressed in the post, were less-than-polite. But this is my blog and it's about my feelings and my feelings aren't always pleasant. I hope to learn from them, though, and to respond better and to do better in the future. And that's why I write. There was another piece to the story that I hadn't previously shared as it didn't have anything to do with the interaction with the woman at Starbucks. It also wasn't the most-sunshiney of stories but this one, at least, has a happy ending. Before we had even entered the clothing section at Target, Max made a request. "Mom! If they have BFF necklaces, I have to get it!" "I have to give one to Ellie. She's my best friend forever and I need her to know that even when we're not in the same class anymore we're still best friends." "Well, I think she already knows that, buddy, but I get what you're saying. They may not have them here, but we can look." But, it's Target, and Target, by blessing or curse, has every goddamn thing you might ever need or want plus everything you didn't even know you needed or wanted until you saw it with a discounted price sticker next to it. So, of course, we found the necklaces: two hearts that fit together like puzzle pieces. 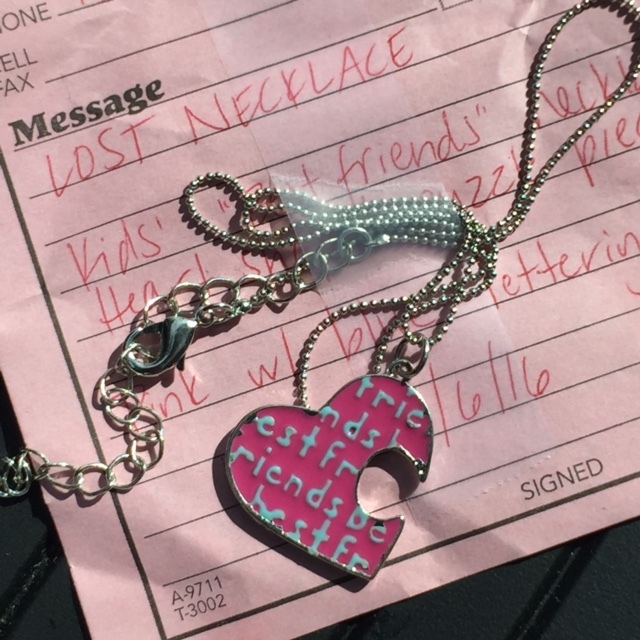 One was pink and one light blue, with "best friends" printed across them. He hemmed and hawed over it for the rest of the shopping trip because it wasn't exactly the one he had pictured. But, in the end, he decided to get it because, of course he did. We finished up shopping, paid for our things, and headed over to Starbucks. We'll just fast-forward now to sitting down with our cake pops and cappuccino and he killed me: "Mom. Let's practice. You be Ellie and I'll be Max and I'm going to give you the necklace. Pretend like you don't know I'm going to give it to you." "Okay," I agreed. Then, acting naturally, "Doo da doo, doo, doo..."
"Hey, Ellie, it's me Max.....wait, wait, wait, start over. She'll know it's me. Okay. Hey, Ellie!" "So, since we're best friends and all I wanted to give you this Best Friends necklace so we can both wear them and always think of each other, even if we're not in the same class or even if we don't see each other." He handed me the pink puzzle piece necklace. "Wow, Max! I love it! Thank you so much!" We hugged and went back to our treats. I suggested he wear both of the necklaces, since he had insisted on taking them out of the packaging, to keep them safe. Awhile later, we had left Starbucks and had driven to my sister's new apartment. We were going to help her and my parents move some of her things in. After making a few trips from her car and into her new place, Max shrieked. "Mom! I lost Ellie's necklace! Look! The pink one is missing!" I thought he was playing a joke on me but, alas, he wasn't. We looked everywhere: in the apartment, in the parking lot, around all of our cars, everywhere. He was devastated. He said that he would give her his necklace, the one that was still around his neck, but that still left him without one. I assured him that, with or without the necklace, Ellie and he would always be friends...but that doesn't help much when you've lost your brand-new Best Friend necklace. We drove back to Target. We looked around the parking space we had parked in, we looked in the carts in the cart corral. We went back in and looked in Starbucks, the last place we knew we had it. It was nowhere to be found. We even asked at the Customer Service desk if anyone had found it and turned it in. It was a long shot, but we had to try. "Nope," the kid behind the desk said, after searching every drawer. "I'm really sorry, but it's not here. Want to fill out a ticket? We can give you a call if it turns up." We did, of course, but I Got Real with Max. "The chances of someone finding it and turning it in are slim, but we can hope for the best, right?" Three nights later, at 9:15 pm, the telephone rang. "Is this Sarah? This is Wendy from Target. We have your Best Friends Necklace here! One of our Target team members found it in one of the carts." We put it together later in the conversation, but Wendy from Target is the SAME Wendy from Target who helped me track down an elusive Ever After High doll a few weeks ago. While on the phone with me, she scoured the toy section and dug through the back room until she found the ONE Darling Charming, Dragon Games edition, the website promised was in stock. Wendy is my Target Angel. There is good and kindness in this world. And there are still people who put forth the extra effort for strangers in this world, too. It shouldn't be so hard, should it? To say something nice to someone? It should be the easiest, most natural thing in the world for kind words to roll off of our tongues and sparkle into the heart of the recipient. But it's not always so easy or natural...or kind, to pay a compliment. I read an article the other day titled "Stop Calling My Baby Cute" or something like that. I had to click on it, of course, because I'm sorry? What? Where is she going to go with this? Is her baby not cute and she's sick of people lying to her? Impossible. Fact: Babies are cute. I had to read it. I had to know. This new mom was tired. She was exhausted and overwhelmed and all used up. When out in the world interacting with Other People in the days and weeks that followed her baby's birth, she kept hearing the same thing: "Your baby is so cute. He is just perfect." And he was...of course...until he wasn't. He was cute, sure, but he was also needy and demanding and kind of a mystery, as first babies (and most brand-new babies) tend to be. She felt guilty when her baby received these compliments because it made her feel like she wasn't appreciating his beauty, his perfection. She was only feeling, only recognizing, the hard parts of parenthood. I get it. Kind of. But not really. I mean, I can understand completely feeling like I'm not always experiencing the Best my kid has to offer. Parents are often the ones on the receiving end of the worst sides of their kids because it is in front of his parents that is the safest place for a kid to show his less-than-shiny sides. We're the unconditionals in a world full of judgement and optional relationships. But, come on. Stop calling a baby cute? It's not going to happen. Learn to accept the compliment with grace and gratitude, Mom, because "Your Baby is Cute" and "Babies are Hard Work" are not mutually exclusive. But it's easier said than done. I had to practice this Grace and Gratitude for a wayward compliment the other day. It wasn't easy. For Max's March Mommy Date, he chose to go shopping for his spring wardrobe. After spending an hour in the neon and glittery world that is the Target Girls' section, we headed to the in-house Starbucks for some well-deserved cake pops and a cappuccino. While in line, a couple approached us. They were, maybe, in their 50s and had a decidedly unimpressed teenager with them. The woman reached out and touched my arm, which was weird in itself, and said, "I'm sorry, but I have to ask..."
To which, I responded by bristling because, no, you're not sorry and no, you don't have to ask. I prepared myself for the impending rudeness that was sure to follow a lead-up like that. She gestured toward Max. "Where, on Earth, did you get her hair cut?" I put my hands on Max's shoulders to steady myself, as I have had to do many times since he shared with us his preference for wearing skirts. "His," I said, pointedly. Her hand flew to her chest in classic church-lady, pearl-clutching gesture of shock and awe. "I cut his hair," I continued, smiling broadly. "Just yesterday, actually. Doesn't he look great?" She looked him up and down before meeting my steely gaze. "I am So. So. Sorry," she said, the look of disgust on her face (directed at herself, I can only allow myself to imagine) unmistakable. "Don't be!" I assured her in a sing-song voice. "I'm not!" And I turned my back on her, directing Max's attention to the different flavors of cake pops he had to choose between. Here's the thing: she was trying to pay Max a compliment. I'm sure that what was to follow "Where, on Earth, did you get her hair cut?" was going to be "it is just adorable!" It had to have been, right? There's nothing wrong with that statement. Except the pronoun. So here's where she went wrong...talking to me instead of to the person she was actually trying to compliment. Talking over the head of a child clearly old enough to understand words and to respond in some way to the words directed at him. She should have walked over to us, looked at Max, and said TO HIM, "I have to tell you, I LOVE your hair cut." He would have beamed. I would have smiled, genuinely, and she would have gotten out the words that so desperately needed to leave her mouth. But she didn't. So instead, she walked away, probably mortified, while I faked grace and gratitude on behalf of the little, listening ears standing beside me. And then I bought him two cake pops, so he wouldn't have to choose. Just be nice to each other. Don't use pronouns when you don't have to. Accept compliments, even when they're misguided or skewed (clearly a work in progress for me). And for God's sake, let people call your baby cute. Sheesh.